CROCKETT, David, (father of John Wesley Crockett), a Representative from Tennessee; born at the confluence of Limestone Creek and Nolichuckey River in the State of Franklin, present day Greene County, Tenn., August 17, 1786; attended the common schools; served in Creek campaign, 1813-1814; member of the Tennessee state house of representatives, 1821-1823; unsuccessful candidate for election to the Nineteenth Congress in 1825; elected as a Jacksonian to the Twentieth Congress (March 4, 1827-March 3, 1829); changed from a Jacksonian to an Anti-Jacksonian; elected as an Anti-Jacksonian to the Twenty-first Congress (March 4, 1829-March 3, 1831); unsuccessful candidate for reelection to the Twenty-second Congress in 1830; elected as an Anti-Jacksonian to the Twenty-third Congress (March 4, 1833-March 3, 1835); unsuccessful candidate for reelection to the Twenty-fourth Congress in 1834; fought at the Battle of the Alamo, San Antonio, Tex., 1836; died about March 6, 1836; remains cremated. Papers: 1834, 1 item. A letter from Davy Crockett to Henry R. Storrs written on January 9, 1834. In the letter, Davy Crockett states that his narrative will be ready for the press in about one month, and asks Storrs to get prices from printers and book-sellers in Buffalo. Also mentions his reasons for writing the autobiography. The letter may have been penned by Thomas Chilton, or someone else, since it is not written in Crockett's usual unpunctuated style. Papers: 11 letters and 14 photographs. Original and copies. Papers: 1814-1834, 2 items. Letters of Davy Crockett. Papers: 1833, 1 item. A letter from Davy Crockett to Lewis Cass written on November 28, 1833. In the letter, Davy Crockett recommends James Rodgers of the Cherokees as Subagent to the Seminoles of Florida. Papers: 1834, 1 letter. A letter from Davy Crockett to Charles Schultz written on December 25, 1834. In the letter, Davy Crockett complains of Andrew Jackson's sway with American voters, calling them "Volunteer Slaves (i.e., paid industrial labor)," and announces his plans to leave the United States and move to Texas. Crockett writes that if Martin Van Buren is elected President, "I will leave the United States ... I will go to the wildes [sic] of Texas." Papers: 1834, 1 item. A letter from Davy Crockett to his publishers, Carey & Hart, written on May 27, 1834. In the letter, Davy Crockett writes that admission to the Pforzheimer Collection is granted through application to the Office of Special Collections. Papers: In the John Ross Report and Letter, 1814-1831, 2 items. A casualty report (March?, 1814) written shortly after the battle at Horseshoe Bend and letter (Jan. 13, 1831) to Congressman David Crockett, regarding the lack of federal protection in the face of Georgia's usurpation of Cherokee lands and liberties. Ross' report lists casualties by company, notes the severity of injuries, and totals the number of killed and wounded. His letter to Crockett expresses the hope that the present Congress would relieve the Cherokee's sufferings and views the Indian policy of President Andrew Jackson as "unrelenting and in effect ruinous." Papers: 1834, 1 item. A letter from Davy Crockett to his publishers, Carey & Hart, written on December 21, 1834. 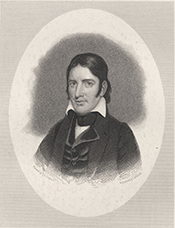 In the letter, Davy Crockett informs his publishers of the progress he is making on his book (An account of Col. Crockett's tour to the North and Down East) and expresses concern that Clark, his ghost-writer, will not be able to keep up with him; requests an advance of $300 in order to repay a debt. Papers: 1835, 1 item. A letter from Davy Crockett to his publishers, Carey & Hart, written on January 22, 1853. In the letter, Davy Crockett informs his reports that he has completed his part of the book, but that Mr. Clark, the ghostwriter, is ill. He furtehr discusses some details he wishes to include in the present book and declares his intention, against the firm's objections, to write a life of Martin Van Buren. Davy Crockett closes with news of a duel between Rep. Henry Wise of Virginia and his predecessor Richard Coke. Papers: 1835, 1 item. A letter from Davy Crockett to Elizabeth Crowder written on January 11, 1835. In the letter, Davy Crockett writes in response to an inquiry about family history, listing his mother's siblings and her father; the Hawkins family came from Maryland and settled in Tennessee, Kentucky, and Ohio. Crockett acknowledges possible family connection with correspondent. Abbott, John S[tevens] C[abot]. David Crockett. 1898. Reprint, New York: Dodd, Mead and Company, . ___. David Crockett: His Life and Adventures. New York: Dodd & Mead, 1874. Reprint, N.p. : Indypublish.Com, 2003. Albanese, Catherine L. King Crockett: Nature and Civility on the American Frontier. Charlottesville: University Press of Virginia, 1979. Allen, Charles Fletcher. David Crockett, Scout. Philadelphia & London: J. B. Lippincott Company, . Arpad, Joseph John. "David Crockett, An Original Eccentricity and Early American Character." Ph.D. diss., Duke University, 1969. Beals, Frank Lee. Davy Crockett. Illustrations by Jack Merryweather. Chicago: Wheeler Publishing Company, . Blair, Walter. Davy Crockett, Frontier Hero; The Truth As He Told It, The Legend as Friends Built It. New York: Coward-McCann, 1955. Burke, James Wakefield. David Crockett, the Man Behind the Myth. Austin, Tex. : Eakin Press, 1984. Catron, Anna G. "The Public Career of David Crockett." Master's thesis, University of Tennessee, 1955. Cobia, Manley F., Jr. Journey Into the Land of Trials: The Story of Davy Crockett's Expedition to the Alamo. Franklin, Tenn.: Hillsboro Press, 2003. Connelly, Thomas Lawrence, ed. "Did David Crockett Surrender at the Alamo? A Contemporary Letter." Journal of Southern History 26 (August 1960): 368-76. Corby, Jane. The Story of David Crockett. New York: Barse & Hopkins, . Crockett, David. Adventures of Davy Crockett, Told Mostly By Himself. New York: Scribner, 1955. ___. Davy Crockett, His Own story: A Narrative of the Life of David Crockett of the State of Tennessee. Bedford, Mass. : Applewood Books, . ___. Davy Crockett's Own Story. New York: Citadel Press, 1955. ___. A Narrative of the life of David Crockett of the State of Tennessee, Written by Himself. Introduction by Paul Andrew Hutton. Lincoln, NE: University of Nebraska Press, 1987. ___. Davy Crockett's Own Story As Written By Himself: The Autobiography of America's Great Folk Hero. Illustrated by Milton Glaser. Stamford, Conn.: Longmeadow Press, 1992. ___. "Fighting the Creeks with Andrew Jackson." In From the Horse's Mouth, edited by George Mandel, pp. 17-43. New York: McBride, 1956. Davis, Curtis C. "Legend at Full Length." American Antiquarian Society Proceedings. 69, No. 2 (1960): 155-74. ___. Life of Davy Crockett, by Himself. New York: New American Library. 1955. ___. Narrative of the Life of David Crockett of the State of Tennessee. Facsimile ed. Knoxville: University of Tennessee Press, 1973. Davis, William C. Three Roads to the Alamo: The Lives and Fortunes of David Crockett, James Bowie, and William Barnet Travis. New York: HarperCollins Publishers, 1998. Derr, Mark. The Frontiersman: The Real Life and Many Legends of Davy Crockett. New York: William Morrow, 1993. Ellis, Edward S. Life of Colonel David Crockett. Philadelphia: Parter and Coates, 1884. ___. Life of David Crockett. Oxford, Miss. : Guild Bindery Press, 1989. Folmsbee, Stanley J. "David Crocket and His Autobiography." East Tennessee Historical Society Publications 43 (1971): 3-17. ___. "David Crockett and West Tennessee." West Tennessee Historical Society Papers 28 (1974): 5-24. ___. "David Crockett in Texas." East Tennessee Historical Society Publications 30 (1958): 48-74. ___. "The Early Career of David Crockett " East Tennessee Historical Society Publications 28 (1956): 58-85. Folmsbee, Stanley J. "David Crockett and His Autobiography." East Tennessee Historical Society Publications 43 (1971): 3-17. ___. "The Early Career of David Crockett." East Tennessee Historical Society Publications 28 (1956): 58-85. Folmsbee, Stanley J., and Anna Grace Catron. "David Crockett: Congressman." East Tennessee Historical Society's Publications 29 (1957): 40-78. French, Janie Preston Collup, and Zella Armstrong. Davy Crockett and the Crockett Family. Chattanooga: Lookout Pub. Co., . Harper, Herbert L., ed. Houston and Crockett: Heroes of Tennessee and Texas: An Anthology. Nashville: Tennessee Historical Commission, 1986. Heale, M. J. "The Role of the Frontier in Jacksonian Politics: David Crockett and the Myth of the Self-Made Man." Western Historical Quarterly 4 (1973): 405-23. Hoffman, Daniel G. "Deaths and Three Resurrections of Davy Crockett." Antioch Review 21 (Spring 1961): 5-13. Hogue, Albert Ross. Davy Crockett and others in Fentress County who have given the county a prominent place in history. Jamestown, Tenn.: N.p., 1955. Johnston, Marianne. Davy Crockett. New York: PowerKids Press, 2001. Kilgore, Dan. How Did Davy Die? College Station: Texas A&M University Press, 1978. Lofaro, Michael, ed. Davy Crockett: The Man, the Legend, the Legacy, 1786-1986. Knoxville: University of Tennessee Press, 1985. Lofaro, Michael and Joe Cummings, eds. Crockett at Two Hundred: New Perspectives on the Man and the Myth. Knoxville: University of Tennessee Press, 1989. Loomis, C. Grant. "Davy Crockett Visits Boston." New England Quarterly 20 (September 1947): 396-400. Mendenhall, Michael J. Davy Crockett and the Unconstitutional Welfare State. Monterey, Calif.: The Institute for Constitutional Research, 1990. Miles, Guy S. "David Crockett Evolves, 1821-1824." American Quarterly 8 (Spring 1956): 53-60. Null, Marion M. The Forgotten Pioneer: The Life of Davy Crockett. New York: Vantage, 1954. Rourke, Constance. Davy Crockett. New York: Harcourt, Brace and Co., 1934. Reprint, illustrated by James MacDonald; introduction to the Bison Books edition by Michael A. Lofaro. Lincoln: University of Nebraska Press, . Schaare, C. Richard. The Life of Davy Crockett in Picture and Story. New York: Cupples & Leon Company, . Shackford, James A. David Crockett: The Man and the Legend. Chapel Hill: University of North Carolina Press, 1956. ___. David Crockett: The Man and The Legend. Edited by John B. Shackford. Introduction by Michael A. Lofaro. Lincoln: University of Nebraska Press, 1994. ___. "David Crockett and North Carolina." North Carolina Historical Review 28 (July 1951): 298-315. Sketches and eccentricities of Col. David Crockett of West Tennessee. New York: J. & J. Harper, . Reprint, New York: Arno Press, 1974. Smith, Jonathan Kennon. Davy Crockett and His Adventures in Texas. New York, Chicago [etc. ]: C. Scribner's Sons, . ___. The Land Holdings of Colonel David Crockett in West Tennessee. [Jackson, Tenn.]: J.K.T. Smith, 2003. ___. On to the Alamo: Col. Crockett's exploits and adventures in Texas. Edited with an introduction and notes by John Seelye. Cincinnati: U.P. James, 1839. Reprint, New York: Penguin Books, 2003. Sprague, William Cyrus. Davy Crockett. New York: The Macmillan Company, 1915. Stiffler, Stuart A. "Davy Crockett: The Genesis of Heroic Myth." Tennessee Historical Quarterly 16 (June 1957): 134-40. Taylor, Vincent Frank. David Crockett, the Bravest of Them All, Who Died in the Alamo. San Antonio: Naylor Co., . Torrence, Robert McIlvaine. Colonel Davy Crockett. Washington: Printed by H. Fagan, 1956. Tousey, Sanford. Davy Crockett, Hero of the Alamo. Story and pictures by Sanford Tousey. Chicago: A. Whitman, 1948. Wright, Marcus Joseph. Colonel David Crockett of Tennessee. Washington, D.C.: N.p., 1897.